Here's a good article on the test, plus a link to an amateur video of the two launches. Should be able to work out the launch locations from this video. However, the thumbnails of the intercept itself are going to an error page. The U.S. Missile Defense Agency, in cooperation with the Joint Functional Component Command for Integrated Missile Defense, U.S. Northern Command, and elements of the U.S. Air Force Space Command’s 30th, 50th, and 460th Space Wings, conducted a successful test today against an Intercontinental Ballistic Missile (ICBM) class target. This test was the first salvo engagement of a threat-representative ICBM target by two Ground Based Interceptors (GBI), which were designated GBI-Lead, and GBI-Trail for the test. The GBI-Lead destroyed the reentry vehicle, as it was designed to do. The GBI-Trail then looked at the resulting debris and remaining objects, and, not finding any other reentry vehicles, selected the next ‘most lethal object’ it could identify, and struck that, precisely as it was designed to do. 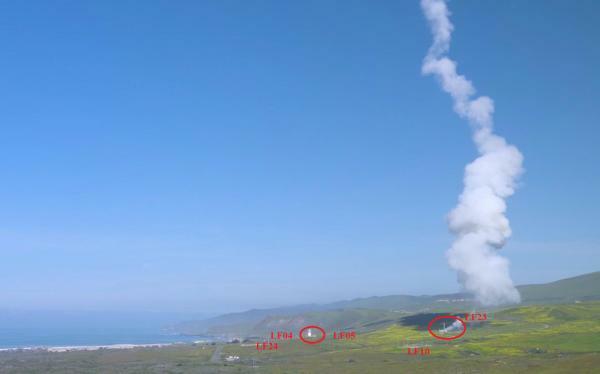 On Monday, March 25th, 2019, the Missile Defense Agency successfully conducted the first GBI salvo intercept test against an ICBM target. The Rexus-26 sounding rocket was launched from Kiruna on March 19. It carried 5 student experiments and reached an altitude of 82 km. I think that the first launch was from LF23 and the second (possibly) - from LF05. The two AZURE Black Brant XIA missions from Andoya, Norway that were schedule from 3 to 20 March have been delayed to next year as the launch conditions were not favourable. I was confused last night, and thought these were debris from a GTO launch of four comsats on Soyuz. A most excellent video of the impacts. Another, from somewhat further away in Finland, from an aurora cam. reports on a FB group of "what appeared to be a rocket" launch east of port canaveral last night. SLBM test? are those given notice?